A classical design will be featured on The Canadian Numismatic Association’s 2004 Convention medal. This year’s convention will be held in Toronto and the organizing committee selected a statue from a local historic landmark to appear on the medal. The design was selected in consultation with the members of the Toronto Coin Club, now in its 69th year, and the oldest continuously operating coin club in Canada. 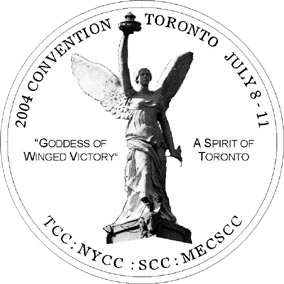 “The Winged Goddess of Victory” is the central element of the medal’s design. The Goddess is shown standing at a ship’s bow as she travels optimistically into the future and represents “A Spirit of Toronto” as the City positively leaves behind its worldwide negative news headlines of the past year. Above the statue appears 2004 CONVENTION and the convention location and dates TORONTO JULY 8 – 11. Below are the initials of the four coin clubs now operating in Toronto, appearing in the sequence they were formed: TCC (Toronto Coin Club); NYCC (North York Coin Club); SCC (Scarborough Coin Club) and MECSCC (Mississauga-Etobicoke Coin Stamp and Collectibles Club). The obverse of the medal features the seal of the Canadian Numismatic Association. 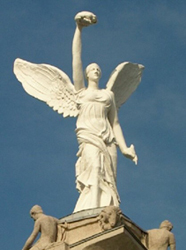 “The Winged Goddess of Victory” is easily recognized as the dominant feature of the gates at the eastern entrance to Exhibition Place, the home of the Canadian National Exhibition in Toronto. These gates have a width of 300 feet and consist of a single Roman style centre arch of cement and stone where the statue stands. It is flanked on each side by a colonnade of nine Ionic columns representing the nine provinces making up Canada at the time of the gate’s construction. The Exhibition grounds are located to the west of downtown Toronto along the shore of Lake Ontario. The land, originally set aside for the 129 year old Canadian National Exhibition, is now also the home of The National Trade Centre, the Royal Agricultural Winter Fair and the Toronto Molson Indy car race. These gates have the popular name “Princes’ Gates” around Toronto, although many local residents, while pronouncing the name correctly, mistakenly believe they are the “Princess Gates”. The original planned name was to be the “Diamond Jubilee of Confederation Gates,” but popular usage has caused the name to be changed in commemoration of the two Princes who opened the gates Tuesday August 30, 1927. This was His Royal Highness The Prince of Wales, Edward and His Royal Highness Prince George, the Duke of Kent. Prince Edward reigned during 1936 as Edward VIII before abdicating. Prince George died in combat in 1942. The gates were built to celebrate the 60th anniversary of the Confederation of Canada in 1927. Celebrations had been postponed from 10 years earlier because of World War I. The gate’s design was the work of Alfred Chapman, of the architectural firm Chapman & Oxley and the statuary the work of Charles Duncan McKechnie. This partnership was responsible for many important buildings around downtown Toronto, including the 1932 addition to the Royal Ontario Museum, the 1919 Harbour Commission Building and other buildings on the Exhibition grounds built during the 1920s including the Ontario Government Building and the Electrical Engineering Building. The gates and all of these buildings were built in what is known as the Beaux-Arts style. This style features large arches, a symmetrical façade, classical ornamentation and highly decorated medallions, shields and statues. Alfred Chapman, while a Toronto resident, was influenced towards this style because he studied architecture in Paris. Construction of the gates began on April 14, 1927 and was complete in time for the opening ceremonies on August 30 at an original cost of $152,240. Charles McKechnie modelled the statue on the Winged Victory of Samothrace. This famous statue, found on the island of Samothrace in 1863 by the French archaeologist Charles Champoiseau, is now in the Musee du Louvre, Paris. There is much debate over the age of the statue and what it was intended to commemorate. Some scholars date it as early as 250 B.C., some as late as 180 B.C. It is thought by many to commemorate a naval victory. The statue originally stood on the prow of a stone ship, probably as part of an outdoor altar, and was intended to represent the goddess as she descended from the skies to bring victory to the fleet. “The Winged Goddess of Victory” holds high the traditional laurel crown of heroism in her right hand and a maple leaf in her left. The maple leaf was representative of a new spirit of independence in Canada following the First World War. McKechnie’s original statue included a bright electric light in the centre of the laurel crown, but it was removed at some time for unknown reasons. The statue has a wingspan of 10 feet and is 17 feet high with the laurel crown being 85 feet above ground level. The gates consist of additional sculpture including the Ontario and Canadian Coats of Arms. The 38mm medal is being engraved and struck by the Royal Canadian Mint. A quantity of 185 copper and 80 silver proof medals are being struck. They are made available to Convention registrants first as a part of the registration kit and later for individual sale. The price of the copper medal was set at $20 and the silver was set at $45.